Stop water damage with economical, temporary solutions to pipe & roof leaks. Your quick-response, temporary solution for leaky roofs or pipes. Averts workplace slip hazards from water leaks or condensation build-up on floors. Prevents water damage to building interiors, inventory and equipment. Cost-effective, fast, and easy installation in leak prone areas. 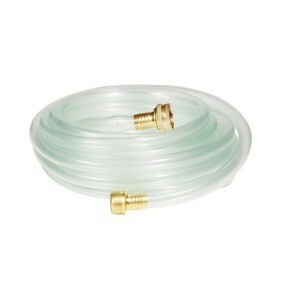 You can connect a standard garden hose or purchase one below. Available in two sizes for roofs or one type for pipe leaks. Lightweight and flame retardant material construction. Straps and drainage hose are sold separately. 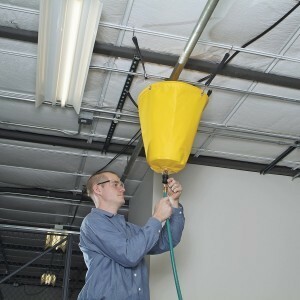 Roof and pipe leak diverters are an economical and quick response for leaky ceilings or conduits. Simply connect a standard garden hose to redirect and drain water as a temporary leak resolution. Our easy-install rectangular roof leak diverter systems help protect your premises, personnel and property by preventing slip hazards and costly asset damage due to water. This temporary leak remediation system quickly contains, channels, and drains water away. It provides an effective and immediate spill response solution to leaky roof or pipes until professional repair or maintenance is complete. We recommend including a leak diverter in any commercial, industrial, or residential building fast-response spill control and spill containment toolkit. They are ideal for use in warehouses, big box stores, schools, gymnasiums, offices, food service, convention and event facilities, or other spaces with an open ceiling design. Protecting your people and property is a top priority in the midst of an emergency situation like an unexpected pipe or roof leak. Damage to equipment, inventory or building structures due to water leaks can quickly escalate into unwanted—and unanticipated—costs. The temporary installation of a ceiling leak diverter prevents the immediate risks of water damage. It also grants you the necessary time to seek a permanent solution and professional repairs to your pipe or roof leak. If the water is leaking through the ceiling tile, remove the tile before installing the diverter. Removing the ceiling tile in the leak area can prevent the water from migrating towards the wall. Water from ceiling and pipe leaks or condensation build-up can quickly become a slip hazard. Using one of our three styles of roof leak diverter kits can help meet OSHA requirements and ensure the safety of your employees or customers due to unexpected water leakages. As added protection you may also want to have on hand a water absorbent spill kit with absorbent mats and absorbent socks. Prevent and keep water off the floor to avoid potential slip or fall risks in any workplace or where people are present. 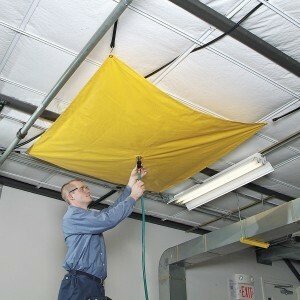 The Roof Leak Diverter comes in two sizes of 5 feet x 5 feet and 10 feet x 10 feet square, heavy-duty fabric drain tarps. They are an excellent choice for controlling either ceiling leaks or condensation drips from plumbing or HVAC tubing sweats. The large, low profile opening effectively collects water from one or more leak locations above. Hose and straps are sold separately. Our Pipe Leak Diverter is ideal for containing spills from conduit and duct holes or leaks. Hang this bucket-style roof leak diverter directly from the pipe or below the affected leak area. With a generous 18" diameter opening it is a great option for a quick, grab-and-go response to isolated or small overhead leaks. Includes 14 inch hanging straps. Drainage hose sold separately. Both systems contain and divert water leaks into a sink, holding tank, or floor drainage outlet using a standard garden hose. Please note that straps for the square fabric roof kits, and drainage hoses for both styles are sold separately. Starting at an affordable price of less than $60.00, these products are an extremely economical addition to your property maintenance and protection equipment. Use a roof or pipe leak diverter in any area susceptible to a water leak or condensation build-up. Ceiling leak diverters install fast to contain water, saving your floor, inventory and machinery from damage. Simply attach the fabric diverter below the ceiling leak, or, hang the bucket-style diverter directly from the pipe itself. The special design of both suspension kit units collects water from overhead leak sites via a central drain fitting. By connecting a standard garden hose you can safely drain water away from the leak area. 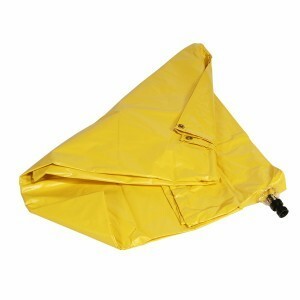 Lightweight and durable vinyl-coated yellow fabric. Flame retardant and non-permeable. No known material handling risks for this product. Download our Leak Diverter Installation Instructions (PDF) to see the simple steps necessary to properly secure, connect, and ensure your equipment is ready for use. Add a roof or pipe leak diverter to your shopping cart today! 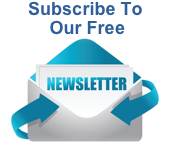 For any questions about shipping or ordering, please contact us by email or call toll free (800) 869-9633. Roof Leak Diverter – Dimensions: 10 feet x 10 feet. Color: Yellow. Vinyl–Coated Fabric. Straps and hose for installation sold separately. Weight 11 lbs. Roof Leak Diverter – Dimensions: 5 feet x 5 feet. Color: Yellow. Vinyl–Coated Fabric. Straps and hose for installation sold separately. Weight 4 lbs. Pipe Leak Diverter – Dimensions: 18 inches x 18 inches. Color: Yellow. Vinyl–Coated Fabric. Includes 14" Straps for installation. Hose sold separately. Weight 3 lbs. Leak Diverter Hose – Dimensions: 25 feet long – 3/4 inch. Color: Clear. PVC & Brass. Weight 1.8 lbs. 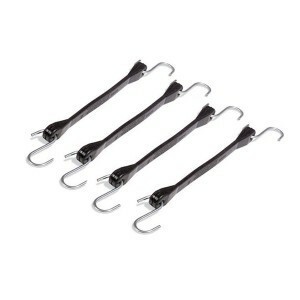 Leak Diverter Rubber Hanging Straps – Dimensions: Four (4) straps each 19 inches long with steel hooks on each end. Color: Black. Weight 1 lbs.